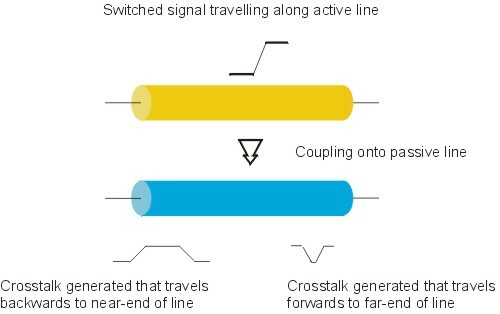 Crosstalk is the unwanted coupling of energy between two or more adjacent lines. This unwanted coupling can change the required signal. Energy that is coupled from the actual signal line, the aggressor, onto a quiet passive victim line so that the transferred energy "travels back" to the start of the victim line. This is known as the backward or near-end crosstalk. Energy that is coupled from the active signal line, the aggressor, onto a quiet passive victim line so that the transferred energy "travels forward" to the end of the victim line. This known as forward or far-end crosstalk. If the victim line is not terminated at both ends in its characteristic impedance the induced spurious signals can reflect at the ends of the line and travel in the opposite direction down the line. Thus a reflected near-end crosstalk can end up appearing at the far end — and vice versa. The magnitude of the near-end crosstalk is dependent upon the mutual capacitance and inductance between the two interacting lines and it will increase to a maximum amplitude as the coupling length increases. where Cm is the mutual capacitance between lines per unit length, Lm is the mutual inductance between lines per unit length, C is the capacitance per unit length of either victim or aggressor and L is the inductance per unit length of either victim or aggressor. The figure, Kb, which shows the maximum near-end crosstalk is a dimensionless ratio of voltages between the victim and aggressor lines. The far-end crosstalk can be considered as an effect caused by the difference in velocity between the odd and even modes of propagation and thus a difference in edge arrival times at the end of the line — see Figures 2 and 3 below. The far-end crosstalk coupling coefficient (FEXT) is a unitless ratio of the maximum voltage perturbation caused on the victim line. Far-end crosstalk increases with a sharper risetime, a longer coupling length and a higher Kf factor. In an ideal homogeneous stripline situation there will be no far-end crosstalk. The electromagnetic fields between two closely coupled lines interact with each other and will affect the behaviour of the signals on both lines. The formulas given here will enable the maximum peak effect to be predicted. For a more complete solution to the crosstalk effect, the s-parameters should be examined. S- parameters define how a single frequency sine wave interacts with a “black box” device and affects the output signal appearing at different output ports. Crosstalk is the output on a port of a line different from the applied signal. Using the “modern” s-parameter port numbering scheme, a signal is injected at port 1, the return loss is S11 and the transmitted signal is S21. Thus the near-end crosstalk is represented by S31, and the far-end crosstalk is represented by S41. Crosstalk parameters from different geometric models and materials can be directly compared to determine their respective merits and identify trends. To transform these s-parameters into the time domain is beyond the scope of the current Si9000, but can be achieved if desired using external tools and methodologies. Note: The Polar CITS series controlled impedance test systems displays crosstalk (XTalk) as a percentage value; the Si9 displays NEXT and FEXT as voltage values normalised to 1 volt. The Si9 value therefore needs to be multiplied by 100 to get the CITS number. 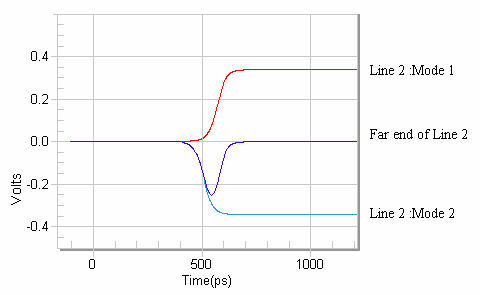 Note that NEXT and FEXT are shown in the Si9000 with values of opposite polarity.